North Central Alberta Amateur Radio Club - Trained volunteer amateur radio operators to provide emergency communications services in times of disaster or serious civil emergencies. A friendly reminder that the monthly meeting this month will be our Annual General Meeting. Saturday March 16 at 9:30 AM at St. Albert Fire Station Number 3. Please come out and support your club. This meeting elects your board members for the upcoming year. Please consider tossing your name into the ring to fill a board position as a lot of the positions have been filled by the same people year over year. Oh and did I mention….. We have door prizes this year. To qualify for a door prize you must be a member in good standing and you must be in attendance at the meeting. If your membership has lapsed you can renew before the meeting via E-Transfer or you can renew at the meeting before the meeting starts. The North Central Amateur Radio Club would like to thank RadioWorld Central for their generous donation of one of the door prizes for the meeting. If you want to pre-plan how to spend your gift card before you win it check them out at https://www.gpscentral.ca/amateur-radio.html. We are looking for volunteers for 2 dates for the Running Room Annual Hypothermic 1/2 Marathon. Please RSVP VA6RZR@gmail.com which day(s) you would be available. 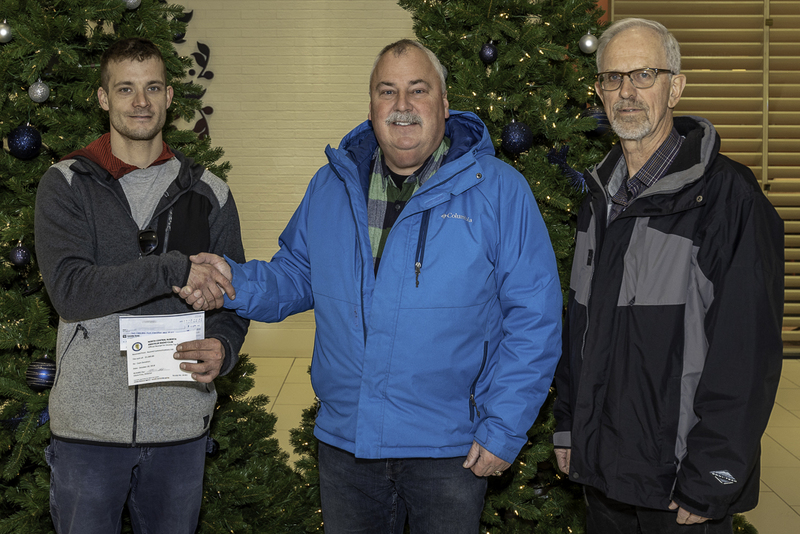 On 20-DEC-2018, NCAARC received a generous cash donation in the amount of $2289.00 from ASCEND COMMUNICATIONS LTD. Dereck MacLean, who is the owner of Ascend Communications, presented the donation to NCAARC President Steve Pedersen (VE6STE) and Treasurer John Van Egdom (VE6XJV). MacLean stated that he supported the fundamentals of amateur radio in the community and wanted to give back to a worthwhile organization. Pedersen and Van Egdom both thanked MacLean for his generosity.